When I first saw the taiko club at my university perform, I was blown away by the whole feel of it. These people looked so cool as they moved themselves in such an intense form, banging huge drums that reverberated around the whole room. So naturally, I joined the club myself about 8 months ago, and now I don't see myself stopping any time soon. A lot of people think that taiko ensembles are the traditional way of playing taiko, but in fact, the modern taiko group is a recent phenomenon, although for centuries traditional Japanese ensembles that include percussion, flutes and traditional local songs have always been around. So what exactly is taiko and why did I and thousands of others end up playing it as a hobby? Let's dondokodon right into it! If you translate the word "taiko", it doesn't mean any old drum. Taiko is a specific type of drum that is made from hollowing out a tree (sometimes cheaper ones can be made from barrels) and covering it with cow skin by either tacking the skin on or stretching it with ropes or bolts. Real, good quality taiko drums are extremely expensive. Not only do the wood, tacks, skin, and intricately designed handles cost money, but creating a drum is a labor intensive process that drives up the price of the drum. Taiko has only really taken off in the past fifty years as a musical and performance phenomenon in the west as of late, but originally taiko were used for the purpose of scaring off enemies in battle. Taiko also has a religious history as it was, and still is, used in temples as a way to call out gods in religious ceremonies. The high school I went to in Japan as an exchange student was right next to a temple, so sometimes we would hear the beating of taiko flow through the window during and after class. Taiko performance groups are actually referred to as kumi-daiko, or literally, group taiko. Kumi-daiko has turned taiko into an art, a sport, a musical phenomenon, and a hobby and passion. There are now thousands of kumi-daiko groups throughout the world who all share the passion of hitting huge cylinders with sticks. And it's pretty cool, honestly. TaikoProject is an American group which aims to modernize and adapt taiko to make it more accessible and fun for a wide audience. So, what do you think? Are you loving taiko yet? I think that the coolest thing about watching or playing taiko in person is the feeling of the vibrations of the drums resonating through your whole body. But if there was only one type or one size, the whole sensation would be a little different. Actually, there is a range of different sounds and pitches that can make up sound the whole ensemble. Even non-drums can be paired up with taiko drums for an even more wagaku music sensation. Byou-uchi-daiko are drums that you normally would think of if you say taiko. They're the ones that are barreled out and have the skin attached with round black tacks. Oodaiko translates to big taiko. And honestly, it's exactly what you'd think it is: a huge taiko. Sometimes there are bachi (taiko drumsticks) that are made in the shape of baseball bats just to hit the oodaiko. 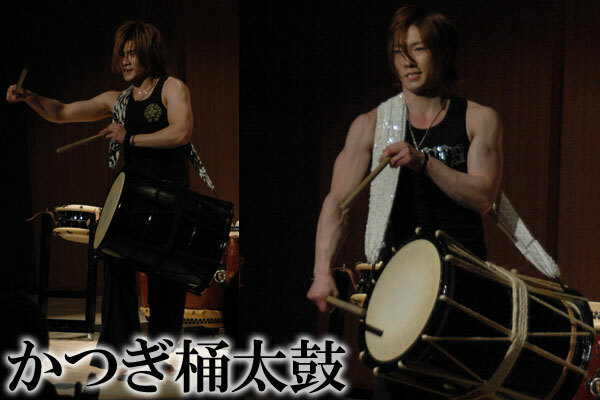 This is why taiko players have to stay in shape. 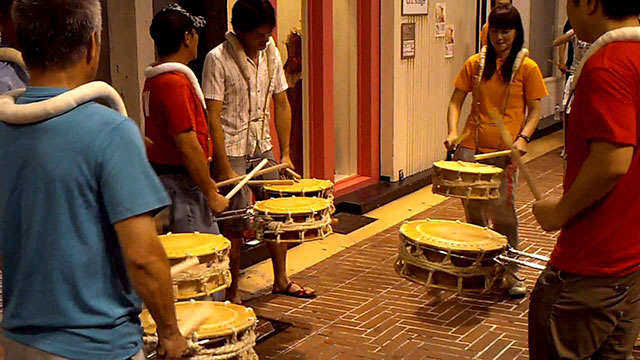 Chuudaiko, sometimes called nagadodaiko, are medium-sized taiko drums. They're the most common. Think, if taiko drums were US coins, they'd probably be quarters. If they were yen, they'd be 100 yen coins: not too big, extremely common, and extremely useful. Chuudaiko can also be pretty easily placed on stands to be played sideways or just be played flat on the ground. Like all other byou-uchi-daiko, they can't be tuned after they're put together, but having a lot of differently-pitched drums all blend together. Hiradaiko is basically just a thin chuudaiko. So what about if you want taiko that you can tune? It turns out that there is another way to stretch the skin across the drum, and that's the shime-daiko. Tsuke-shime-daiko are taiko that have the skin stretched over and attached with either ropest, and, more recently, bolts keeping them tigh. 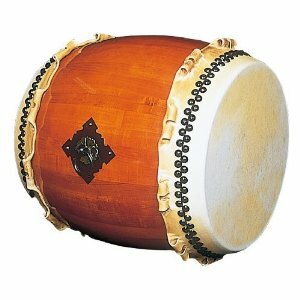 Tsuke-shime-daiko tend to have a less powerful sound, but with a high pitch, they are able to be heard over the booming bass of the byou-uchi-daiko. Shimedaiko is the standard small tsuke-shime-daiko. It's typically used as a metronome, but can also be used in pieces as a main drum as well. Okedodaiko are long shimedaiko. They can be played propped on stands or hung over one's shoulder with a strap. 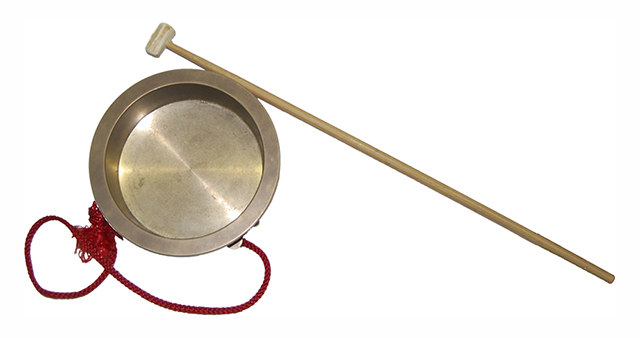 Kozutsumi is a small handheld taiko traditionally used in kabuki. Those are the drums, but what about other parts of the kumi-daiko group? Just like you can't have an orchestra with bow-less violins, we can't have a taiko group without something to hit the taiko with. Bachi are the drumsticks that you use when you play taiko. They can be made of virtually any wood. 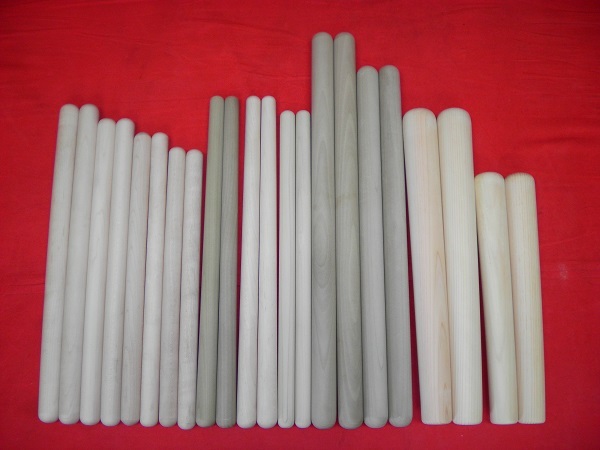 Popular woods used for bachi include oak, magnolia, maple, bamboo, and cypress. 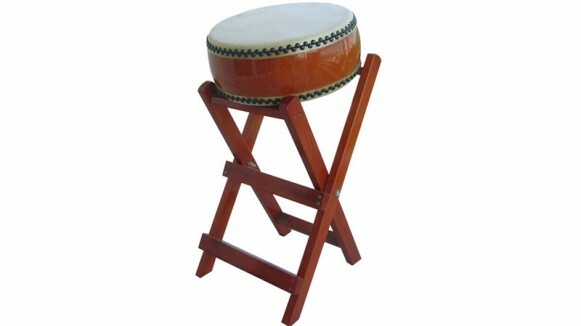 The type of wood that the bachi are made of can completely change the way the drum sounds. 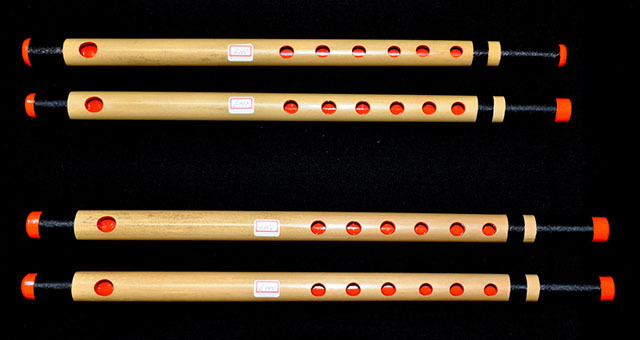 Fue is a traditional flute made out of bamboo. Fue are used a lot in bon dance music and other festival-centered music. Other instruments and drum variations can be used, but these are the main ones. I'd have to say that my favorite might be the chanchiki, possibly for how cool its nickname is. Until recently, taiko sheet music did not exist. One of the most interesting points about taiko is that pieces were traditionally passed down orally, not through written transcription or music. The way of orally "singing" the pieces is called kuchishouka (sometimes kuchishouga). Don doron don don ka ka kara kara don don kara kara don don kara kara su don don ka ka. Recently, a lot of famous taiko masters have been getting old, so pieces are being transcribed more and more often. The ways that they are transcribed differ from person to person though, so there's no way that one person could possibly learn every taiko piece, giving each piece a special and unique feeling. Although actual taiko drums are very expensive, there's a way of making your own practice drums out of tires and clear packing tape. If you're crafty and have a lot of time on your hands, try it and share your results with the rest of the eager world! You can also feel free to learn from books and videos- taiko is an art form where you don't need a master anymore, especially with the internet. Try looking up if there are any taiko groups in your local area and see if there are ways to get involved! 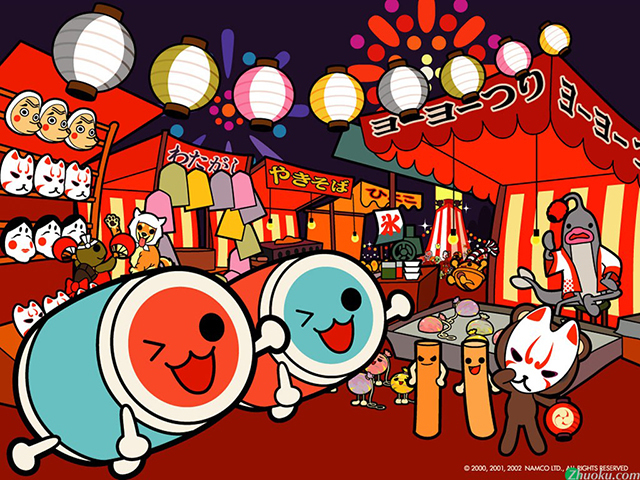 I'm sure you've been waiting for me to mention Taiko no Tastujin, the taiko arcade game that is in every shopping center in Japan. That's my only experience with taiko!, you're saying. I'm really good at that game, so I must be good at taiko!, you're saying. Well, there are good taiko players who are bad at the game and bad taiko players who are good at the game. It's a fun way to learn the basics of the don's and the ka's at any rate, but don't expect it to make you a master. After all, with the video game, you won't learn any form or technique. After a long week, there's nothing more satisfying than playing taiko with an ensemble. 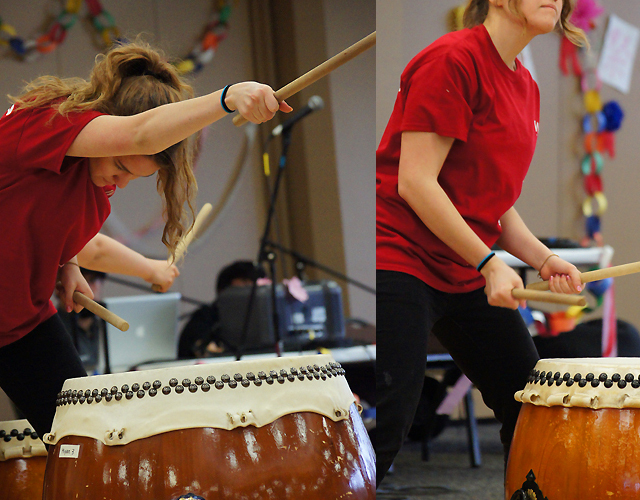 The movement of your body, the concentration on the beat, and the feeling of being connected with your taiko group is an experience like no other. Next time you're watching a performance, maybe you'll know a bit more about taiko and appreciate it a little more. Maybe you'll even want to try it yourself. No matter what, as both a historical and contemporary idea, taiko will still be pretty darn cool when you see it. Have you ever played taiko? Have you seen a group perform? What did you think? Let me know in the comments!